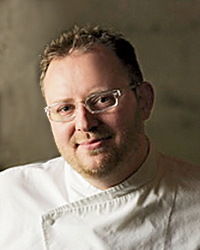 F&W Best New Chef 2008 Ethan Stowell’s steadily-expanding list of Seattle restaurants includes the Italian seafood spot Anchovies & Olives and the rustic, homey How to Cook a Wolf. Here, he talks about his favorite gift ideas, recipes and more for the holidays. What are your favorite holiday gifts for food lovers? Every house should have a meat slicer. Cured meats are underappreciated. There’s a great Italian one sold by a company in Canada called Consiglio’s. They have an 8-inch and a 10-inch. I’ve bought them for a bunch of my friends, they work great. They’re powerful enough to be in a restaurant setting, but they’re not $3,000, and they’re small enough that they can be tucked away in the corner. I also love Scanpans, these high-end, lightweight, nonstick fry pans from Denmark. I use my Scanpan almost every day, whether if it’s making scrambled eggs in the morning, or to sauté a piece of fish at night. It’s supereasy to clean up and it’s durable. Nespresso coffee machines. I like the coffee—I like the taste, it’s always got a nice crema on it. Mine has a built-in steamer, only because I bought a new house and wanted to upgrade. But the old one works great, and it’s just a basic model. Over the holidays, my favorite drink is an old-fashioned. For Christmas I always bring a bottle of Woodford Reserve or Knob Creek and I make old-fashioneds for my brothers and my dad. On Christmas day we just chill out; I cook and watch sports like everybody else, and it’s a nice sipping beverage. It has a little of that holiday in there—the orange, it’s kind of sweet, and it’s really relaxing—you can’t drink it too fast. Have your kitchen clean before the guests arrive. It makes everything so much better. Nobody wants to have their Christmas dinner start off with a big old sink of pots and pans. When you put a dirty pot out onto the counter, too, that counter space is gone. What are your 5 top don’t-miss places on a holiday visit to Seattle? We always go to Candy Cane Lane, this street in Seattle where every house on this one little cul-de-sac decorates to the nines with Christmas lights. Going down to the outdoor Olympic Sculpture Park is great, that’s a nice little walk. It’s all paved, so it’s not a hard walk, and it’s right along the water. In all honesty, holidays are busy, so we don’t get out a ton. But “The Nutcracker” at the Pacific Northwest Ballet, that’s don’t-miss. For shopping, downtown’s always nice, they do a big tree lighting every year at the Westlake Center, and Pike Place Market is always fun at the holidays. There’s a great kids’ store in Ballard called Clover Toys, I’ve bought some presents for my brothers’ kids there. They don’t have the usual Transformers and G.I. Joe stuff—they have more educational, high-end things like recycling trucks to gets kids thinking more about the important things early on. We bought my nephew this little caddy, like one of those Little Red Flyers but designed just for books, to wheel them around. What’s your most requested recipe, the dish you’re best known for? Around the holidays I do a ton of gnocchi cooking classes. We started doing them a couple of years ago, and for the first one, all 20 slots sold out in two hours, and then I had a 50-person waiting list at the end of the week. The Culinaria series. It’s a compilation of all the European countries. They’ve also done one-offs of the more popular countries like Italy, France and Spain. It’s a great combination of picture book and traditional recipes and history. If you’re going to cook something, you should at least have some historical perspective on it. And the recipes are great. It’s all classic stuff, without a lot of fuss about presentation, more about education and tradition. Making an omelet. An omelet is so versatile, it’s not expensive to make and you can put anything in there: chanterelles, spinach, different kinds of cheese. And it makes a nice appetizer or a great lunch with a side salad. As for technique, for me it’s more about having nice quality eggs, making sure the eggs are from a local farm, free-range. I make mine in a Scanpan. I heat the pan over medium heat, melt a little butter in there, then pour in the whisked eggs. Then it’s not a lot of work because it’s a nonstick pan. Once it’s set, I do the three-fold method: I put the chanterelles or goat cheese or whatever down the middle, then fold over the sides, and then flip it out onto a plate with the seam-side down. Why he won Because, as a self-taught chef, he applies his exceptional home-cooking skills to Pacific Northwest seafood and produce to create delicious, accessible dishes. Experience Lampreia, Nell’s and the Painted Table, Seattle.